The Downtown Walk begins at the State House and goes past many of Boston’s earliest historic sites, ending at Franklin and Washington streets, a block below Tremont Street and the Boston Common. The walk features women across the centuries, with a focus on the eighteenth century through the mid-nineteenth century. It includes women who wrote poetry, essays, and plays and spoke out publicly before members of the Massachusetts State Legislature and in Boston’s halls and churches for the abolition of slavery, woman suffrage, and African American and Native American rights. Boston’s downtown area is home to its business and financial institutions, as well as to a major shopping area and the Quincy Market at Faneuil Hall. Directions: Facing the State House, go left to the outside of the West Wing. Anne Hutchinson (1591-1643) was banished from Boston in the first decade of settlement because her religious views were different from those of the ruling ministers. Believing that both men and women could receive grace only from God, she accused the ministers of preaching that “good works” signified holiness. Hutchinson attracted women to prayer meetings she held in her home in part because her beliefs put women’s souls on an equal footing with men’s souls. She was a respected midwife and wife of an established merchant, but was banished in 1638 for heresy (see also D19). This statue, erected in 1922 as a gift of the Anne Hutchinson Memorial Association and the State Federation of Women’s Clubs, was sculpted by Cyrus E. Dallin. Mary Dyer (d. 1660) was a Quaker whose doctrine of Inner Light was similar to Hutchinson’s salvation by grace received directly from God. At the time, practice of the Quaker religion was not allowed in Massachusetts. She witnessed for religious freedom in Boston three times. Twice she was banished, but the third time she was hanged. Dyer was a friend of Anne Hutchinson and walked out of church beside her following Hutchinson’s excommunication. This statue, erected in 1959 from a descendant’s bequest, was sculpted by Sylvia Shaw Judson. In 1996, the Massachusetts legislature recognized that the State House art collection included only a handful of images of women. They recommended that a new work of art be created to honor the contributions of women to public life in Massachusetts. Now permanently installed on a large wall just outside Doric Hall, the work depicts six women selected by an advisory committee. Dorothea Dix (1802-87); Lucy Stone (1818-93); Sarah Parker Remond (1814-94); Josephine St. Pierre Ruffin (1842-1924); Mary Kenney O’Sullivan (1864-1943); and Florence Luscomb (1887-1985) were chosen to represent all the women who dedicated themselves to improving life in the Commonwealth. The two-toned marble panels designed by artists Sheila Levrant de Bretteville and Susan Sellers include words written by the women etched on the stone and bronze busts cast from period photographs. Women were considered citizens with the right to petition long before they gained the right to vote in 1920. Abolitionist Angelina Grimké (1805-79), who was raised by a slave-holding family in the South, spoke out against slavery on a tour of New England with her sister Sarah in 1837. In 1838, she presented a women’s anti-slavery petition with 20,000 signatures to a committee of the state legislature and became the first woman to publicly address the legislature. In 1843, after an eighteen-month survey of jails and poorhouses in Massachusetts, Dorothea Dix (1802-87) prepared a Memorial for the state legislature. “I come to place before the legislature of Massachusetts the condition of the miserable, the desolate, the outcast,” Dix began, as she charged extreme cruelty in the treatment of the mentally ill. The state appropriated funds to improve one facility and she continued her investigations in many other states. During the Civil War, Dix was the superintendent of army nurses for the Union. Directions: At the bottom of the State House steps, face Park Street and turn left on Beacon Street. a portrait of Hannah Adams (1755-1831), a scholar and author who was the first woman to be given reading privileges at the library; and a portrait by John Singer Sargent of Annie Adams Fields (1834-1915). Fields was a noted writer, poet, and social philanthropist, who conducted a literary salon. The offices of the Woman’s Journal, the newspaper published by the American Woman Suffrage Association, and the New England Women’s Club, one of the first clubs for women in the country, were in another building on this site. Edited by Lucy Stone (1818-93), the Journal chose office space as close to the seat of power—the State House—as possible. Stone petitioned annually for woman suffrage. Stone had been one of the first Massachusetts women to receive a college degree when she graduated from Oberlin College in 1847. When she married Henry Blackwell she became the first married woman to officially keep her maiden name, leading to the late nineteenth-century coining of the term “a Lucy Stoner” to mean a woman who stood up for her rights. 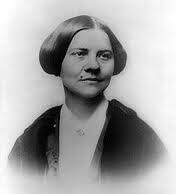 Lucy Stone is one of three women chosen to be portrayed in the Boston Women’s Memorial and one of six to be memorialized in the State House. Alice Stone Blackwell (1857-1950), Stone’s daughter, edited the Journal in a building on Copley Square for twenty-five years until suffrage was granted in 1920. In 1973, a trade union for women office workers named 9 to 5 held its first monthly meetings in this building now owned by the Paulist Fathers. A member decided to organize after her boss walked into the office and said, “Well, I guess there’s no one here.” The Boston chapter of 9 to 5 is now part of District 925 of of the Services International Employees Union. Directions: Continue down Park Street. Cross Tremont Street to Hamilton Place. Directions: Return to Tremont Street and cross it again. Abiah Franklin (1667-1752), mother of Benjamin Franklin, was honored by her famous son when he erected the central high granite obelisk in memory of his parents. She raised 13 children, including Benjamin and Jane Franklin Mecom and was called “a discreet and virtuous woman.”Tradition states that Elizabeth Foster Vergoose, known as “Mother Goose,” is buried here. Widowed, she lived with her eldest daughter and entertained her grandchildren with nursery rhymes. Her son-in-law, printer Thomas Fleet, reportedly published them as Songs for the Nursery or Mother Goose’s Melodies. Directions: Look across the street. The studio of Edmonia Lewis (1845-ca. 1909), a member of the colony of women sculptors in Rome gathering around Charlotte Cushman (1816-76) in the mid-nineteenth century, was located in a former building at this site from 1863-65. As a child, Lewis, who had both African American and Chippewa ancestry, lived with her Chippewa mother’s people. Although she was born free, her favorite subject for her sculpture was freedom from slavery, demonstrated in Forever Free, a sculpture depicting a man and woman breaking their chains, made as a tribute to abolitionist William Lloyd Garrison. It is now on display at the Howard University Gallery of Art. Her most popular work was a bust of Colonel Robert Gould Shaw, the white commander of the African American 54th Massachusetts Infantry during the Civil War. Lewis’s identification with her Chippewa heritage caused her also to revere and create a bust of Henry Wadsworth Longfellow, author of the poem, Hiawatha. The sculpture is now owned by the Fogg Art Museum at Harvard University. Directions: Continue along Tremont Street. Directions: Continue along Tremont Street. Turn right on School Street. Women were elected to the Boston School Committee before they could vote. In 1875, after a drive by the New England Women’s Club, six women took their seats on the Boston School Committee elected by Boston men. Although the Committee was reduced from 116 to 24 members the following year, four women were reelected including Lucretia Crocker (1829-86), who later became the first woman supervisor in the Boston Public Schools, and Abby May (1829-88). May succeeded in starting a separate Latin School for girls, but it was not until 1972 that the two Latin schools became co-educational. When May was defeated for reelection, women all over Massachusetts petitioned the legislature and won the right to vote for school board members, starting in 1879. Julia Harrington Duff (1859-1932) of Charlestown, a former Boston School teacher, was the first Irish-American woman to be elected to the Boston School Committee in 1900. Her rallying cry, “Boston schools for Boston girls,” expressed her belief that Yankee teachers from outside the city were being hired in preference to the young Catholic women graduates of Boston’s Normal School. Boston women teachers pressed for their rights. Among the women challenging the 1880s School Committee regulation that women resign upon marriage were Grace Lonergan Lorch (1903-74) and Suzanne Revaleon Green. Green’s husband, a lawyer, succeeded in having his wife and two other married teachers reinstated to their teaching positions. The regulation remained on the books, however, until 1953 when a state law required its removal. Directions: Return to and cross Tremont Street. Turn right. Go up the stairs through Center Plaza to Pemberton Square. On your left is D13. Jennie Loitman Barron (1891-1969) became the state’s first full-time woman judge in 1934. She served for thirty years, twenty in the Boston Municipal Court and ten in the Superior Court. As a lawyer representing the League of Women Voters, she successfully argued for women’s service on juries. Before she became a judge, Barron served on the Boston School Committee in the late 1920s, where she focused attention on substandard school conditions. Directions: Look to the right of the Court House for the former location of the Howard Athenaeum. Sarah Parker Remond, the grand-daughter of a free black who fought in the Revolutionary War, committed her first act of public resistance at the Howard Athenæum. In 1853, Remond bought a ticket for the opera, Don Pasquale, at the Howard Athenaeum in Boston. When she refused to accept segregated seating, she was forced to leave the theatre and pushed down some stairs. Remond sued for damages and won her case. She was awarded $500, gaining an admission that she was wronged. Remond went on to become an international anti-slavery lecturer. Directions: Walk down the steps through Center Plaza to Cambridge Street. Cross to City Hall Plaza. The Boston City Hall Plaza covers the same ground as the eighteenth century Brattle Square. From 1768 to 1771, Abigail Adams (1744-1817) lived in two locations in and near Brattle Square with her husband, attorney John Adams, and their family. It was a period of increasing family responsibilities for her. Her five children were born between 1765 and 1772. The family lived there during the Boston Massacre, which took place nearby—just outside the Old State House—in 1770. After John Adams successfully defended the British soldiers involved in the incident, his health declined. The family moved back to their farm in Braintree (now Quincy) the following year, but returned to Boston in 1772. They were in Boston during the Boston Tea Party in 1773, but by 1774 the Adamses had moved back to the farm permanently because John began traveling for the new Republic—first as a delegate to the Continental Congress in Philadelphia. Abigail Adams became well known as a critical thinker and correspondent with her husband, who was away from the farm for much of the next ten years. She managed the farm, their large family, and their financial affairs. Abigail Adams is one of three women chosen to be portrayed in the Boston Women’s Memorial. Among Abigail Adams’s correspondents was Mercy Otis Warren (1728-1814), probably the first published women historian in the U.S. In 1805, she published a three-volume history of the American Revolution. She also published several satirical plays. Directions: Walk across City Hall Plaza. Go down the steps, cross Congress Street to Faneuil Hall. Turn left. Cross North Street into Carmen Park, betweeil n Congress and Union Streets. Directions: Return to Faneuil Hall. Note the statue of patriot Sam Adams by sculptor Anne Whitney. Faneuil Hall and the adjoining Quincy Market are the historic locations of Boston’s great women’s fairs and protest meetings. The Anti-Slavery Bazaars, sponsored by the Female Anti-Slavery Societies, were held there in the 1830s and 1840s. In September 1840, women held a seven-day fair to raise money to complete the building of the Bunker Hill monument. Inspired by Sarah Josepha Hale (1820-79), the women raised $30,000. Among the women’s suffrage meetings held in Faneuil Hall was a New England Woman’s Tea Party, sponsored on the centennial of the Boston Tea Party by the New England Woman Suffrage Association. They invited the public to join them in the celebration, noting that women were still subject to “taxation without representation.” In an alcove behind the stage, note the bust of Lucy Stone, a main speaker at the Tea Party. Suzette “Bright Eyes” LaFleshe (1854-1903), an Omaha Indian, inspired the Indian Rights Movement when she spoke in Faneuil Hall in December 1879. LaFlesche, wearing native dress and a bear-claw necklace, protested the reservation system: “Did our Creator…intend that men created in his own image should be ruled over by another set of his creatures?” After hearing Bright Eyes speak in Boston, many Boston women became her supporters. Helen Hunt Jackson (1830-85) was inspired by her speech to write A Century of Dishonor, a book that cited injustices to the Indian peoples, and works of fiction about Native Americans including Ramona. Working women saw Faneuil Hall as a place for a forum for their demands. In 1903, the Women’s Trade Union League was founded in Faneuil Hall. Massachusetts nurses also chose the hall to rally for professional status in 1903 when they founded the Massachusetts Nurses Association. Among the organizers was Lucy Lincoln Drown (1847-1934), superintendent of nurses at Boston City Hospital from 1885 to 1910. In 1919, the call for the women telephone operators’ strike brought two thousand angry women to the hall. Directions: Continue up Congress Street. Turn right on State Street. Turn left on Washington Street. Directions: Continue on Washington Street. A plaque in Spring Lane, on the left, marks the site of the house of Mary Chilton Winslow (d.1679), a Mayflower passenger in 1620. When Old South, the site of mass protest meetings in Revolutionary Boston, was slated for demolition a hundred years later, a group of women bought the building (but not the land) to protect it. Philanthropist Mary Tileston Hemenway (1820-94) then contributed more than half the sum needed to preserve it, becoming an early leader in historic preservation. Phillis Wheatley (ca. 1753-84), the first African American poet to be published in book form, was a member of Old South. While still a child, she was purchased as a slave by the Wheatley family. Her poetry reflects her love of freedom: “Should you…wonder from whence my love of Freedom sprung…I, young in life, was snatched from Afric’s fancy’d happy seat…such, such my case. And can I then but pray Others may never feel tyrannic sway?” Phillis Wheatley is one of three women chosen to be portrayed in the Boston Women’s Memorial. An exhibit depicting her life is permanently displayed here. Directions: Turn left on Milk Street. Directions: Continue down Milk Street to Federal Street. Turn right. Susanna Haswell Rowson (1760-1824), a playwright and an actress at the Federal Street Theatre, was the author of the first American best-selling novel, Charlotte Temple, A Tale of Truth. Rowson arrived in America when she was six, but her father was a Loyalist and during the Revolution they returned to England. Not long after her marriage to William Rowson, Susanna returned to America and settled in Boston where they both acted at the Federal Street Theatre. For the five years following 1796, she performed 129 different parts in 126 productions, many of which she wrote herself. Her next venture was to set up a Young Ladies Academy in 1797 near the Theatre. Rowson moved the school out of Boston but later returned. Her academy was one of the first to offer girls education above the elementary level and included instruction in music and public speaking.Another woman playwright whose plays were performed at the Federal Street Theatre in 1795 and 1796 was Judith Sargent Murray. Her satirical plays, The Medium or Happy Tea-Party (later renamed The Medium, or Virtue Triumphant) and The Traveller Returned, addressed class structure and gender roles in the New Republic.Public speakers lecturing at the Federal Street Theatre included Deborah Sampson (1760-1827), considered to be America’s first female soldier. In 1802, Sampson electrified the crowd as she told her story of fighting in the Revolutionary War for eighteen months disguised as a man named Robert Shurtleff. Directions: Continue to the corner of Federal and Franklin Streets. Among the more well-known Boston women who attended William Ellery Channing’s Federal Street Church were abolitionists Maria Weston Chapman (1806-85) and Eliza Lee Cabot Follen. Chapman, a founder of the Boston Female Anti-Slavery Society, was a supporter of abolitionist William Lloyd Garrison, publisher of the famed abolitionist newspaper The Liberator. An inspired organizer and fundraiser, Chapman ran twenty-two yearly anti-slavery fairs in Boston beginning in 1834. One of her colleagues in this venture was Lydia Maria Child (1802-80) whose 1833 publication, An Appeal in Behalf of that Class of Americans called Africans, was the first book to advocate an immediate end to slavery. Chapman’s fairs became a model for women in other parts of the country to raise money for the abolitionist cause. Chapman also published several important anti-slavery tracts including How Can I Help Abolish Slavery? and Right and Wrong in Massachusetts. With Garrison, Maria Chapman supported women’s full participation in abolitionist work—including public speaking, which had been condemned in a pastoral letter from the Congregational ministers of Massachusetts as being outside women’s God-ordained sphere. In 1840, Chapman was elected to the executive committee of the American Anti-Slavery Society. Eliza Lee Cabot Follen (1787-1860) was best known for her anti-slavery writings including Anti-Slavery Hymns and Songs and A Letter to Mothers in Free States. In A Letter, Follen wrote, “…what can women,—what can we mothers do?…you can do everything; I repeat, you can abolish slavery. Let every mother take the subject to heart, as one in which she has a personal concern. In the silence of the night, let her listen to the slave-mothers crying to her for help….” Much of Follen’s writing was designed for children, including songs, poems, and stories that carried a moral lesson. Directions: Turn right up Franklin Street to Arch Street. The Tontine Crescent was a fashionable place to live in late eighteenth and early nineteenth-century Boston. The long row of elegant townhouses, designed by Boston architect Charles Bulfinch, was built in 1793 and named Franklin Place after Benjamin Franklin. With the opening of the Back Bay for settlement, they declined in fashion and were demolished in 1872 after the Great Fire. Franklin Street still retains the curve of the buildings. Among the notable women who lived there was Judith Sargent Murray (1751-1820), a native of Gloucester, who moved with her husband, John Murray, to No. 5 Franklin Place in 1794. Judith Sargent Murray was already a successful writer, publishing a regular column (“The Gleaner“) in the Massachusetts Magazine, a new literary monthly. Using a male persona, Judith expressed her opinions on female equality, education, federalism, and republicanism. She wrote that not only should a woman be educated to be “the sensible and informed” companion of men, but she should also be equipped to earn her own living. Murray saw the many new female academies as inaugurating “a new era in female history.” In 1798, she published her “Gleaner” essays in a book she also called The Gleaner, selling it to a list of subscribers including John Adams and George Washington. The Gleaner became a minor classic, and Murray became the first woman in America to self-publish. She was also a poet, publishing in various Boston periodicals under the pen names “Honora Martesia” and “Constantia.” An avid letter writer, the copies of letters Murray wrote from 1765-1818 (ages 14-67) were discovered in 1984, and offer a new eyewitness account of early American history. Abby May (1829-88), also an advocate for women’s rights, lived at 5 Franklin Place with her family as a young woman. Among her many achievements, May succeeded in starting a separate Latin School for girls and served as one of the first women on the Boston School Committee. Directions: Continue up Franklin Street to Washington Street. If you turn left on Washington Street to West Street, you can join the Chinatown loop of the Boston Women’s Heritage Trail. If you turn left on Washington Street and right on Winter Street, you will at Boston Common near Park Street and below the State House, where you started the Downtown Walk.